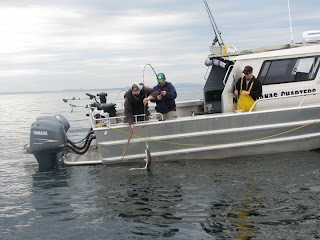 Most of the fishing effort around Sooke this weekend was for halibut, for Island Outfitters Just for the Halibut Derby. Anglers were spread out from Oak Bay to Owen Point. 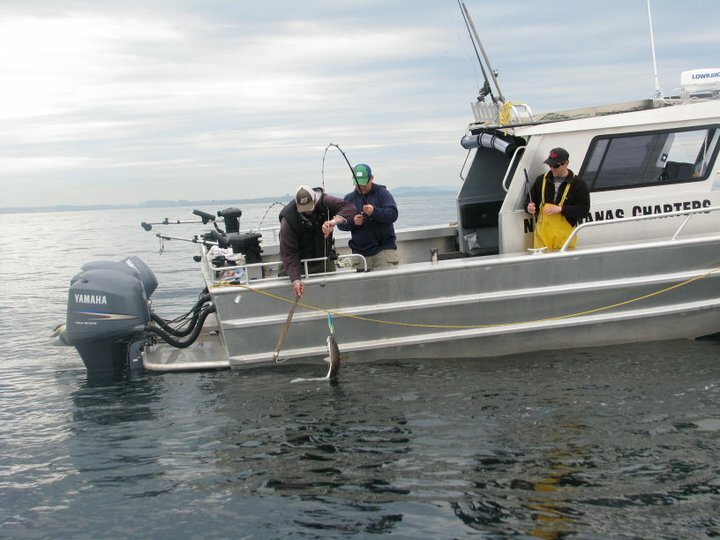 The tides weren't the best, but 68 halibut were weighed in. Here's a photo of the No Bananas Fishing Charters team bringing one in....and a video too. The 194 pound winning fish came from Sooke, just off Secretary Island. Al Crow caught it, video of pulling it aboard. This was his second fish near or above 200 pounds in a week. He won $7500 for this one. Unfortunately, he was 8 pounds shy of the $25,000 bonus prize ... but the one he caught last week would have won it! Still, not bad for a day's fishing. Salmon reports have been spotty, with not too many people chasing them. There have been some nice hatchery chinook in the teens reported and a few up to 20 pounds, just out front of Sooke Harbour. Around the corner from Beechey Head towards Whirl Bay has been reported good on some days.